Lou and Peter Berryman were both raised in Appleton, WI, and began playing music together in high school during the sixties. During the following nomadic decade, Lou studied classical voice and music theory in college while Peter continued an unfocused fascination with surrealist art, beatnik poetry, and jug band music. Early influences of American and British musical comedy and folk music fed a growing repertoire of original songs. 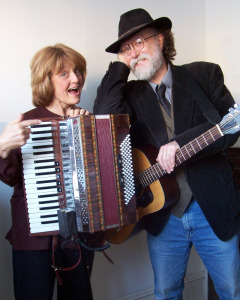 A brief marriage in the early seventies resolved into a lifelong friendship, and by the late seventies and early eighties the two were honing their skills playing regular weekly concerts in Madison, becoming full-time musicians and songwriters in 1979. During those early years they wrote new songs every week, many about the history, cheese, beer and strange politics of their home state. By the mid '80s they were traveling all across the country, still writing and singing, but now with a broader perspective, finding that the quirks of their home state were not so much Midwestern as human. In twenty-five years of performing together, Lou and Peter have released twenty albums and four songbooks worth of hilarious, quirky, yet oddly profound songs, rich with word play and interesting images. Pete Seeger, Tom Paxton and Tom Lehrer count themselves among their fans. Their work has appeared in numerous compilations such as the popular "Rise Up Singing" songbook, in periodicals like "SING OUT! Magazine", and in many audio compilations. Berryman songs are being sung around the world by a legion of professional musicians including Peter, Paul and Mary, Garrison Keillor and Peggy Seeger. They have appeared numerous times on such national programs as NPR's "A Prairie Home Companion" and "Weekend Edition."